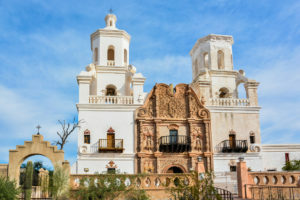 On Saturday, May 4, 2019, join the Arizona Archaeological and Historical Society (AAHS) for a personalized tour of the historic Mission San Xavier del Bac, located 10 miles south of downtown Tucson at the village of Wa:k (San Xavier District) on the Tohono O’odham reservation. The mission was founded in 1692 by Padre Eusebio Kino in the center of a centuries-old Indian settlement of the Sobaipuri O’odham located along the banks of the Santa Cruz River. It is the oldest European structure in Arizona, and labor for the construction was provided by the O’odham. It is an outstanding example of Spanish Colonial architecture in the United States. The tour will start at 12 noon and last about an hour. Group size is limited to 20 people. The Patronato San Xavier requests a $5 donation per person to support the mission. To reserve your space email Katherine Cerino at kcerino@gmail.com.